The millennial entrepreneur whose 2017 Fyre Festival began with promises of music and luxury in the Bahamas and descended into a chaos of badly constructed tents, cold cheese sandwiches and a lack of sufficient bathrooms may soon find himself in the no-frills accommodations of a U.S. federal prison. Billy McFarland, 26, told a judge Tuesday that he “grossly underestimated the resources that would be necessary to hold an event of this magnitude.” McFarland may spend a decade in prison after admitting he defrauded 80 investors and a ticket broker out of more than $26 million. The event was promoted heavily on social media by models and celebrities including Kendall Jenner, Bella Hadid and Emily Ratajkowski. Ticket buyers were promised a fantasy of beautiful models, luxury temporary accommodations and fine food. 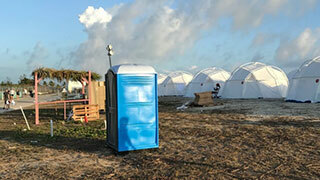 But when patrons paying as much as $12,000 for a “life-changing” Caribbean music festival deplaned on Great Exuma last April, they found port-a-potties instead of bathrooms, cheese sandwiches instead of gourmet grub and tents instead of private villas. The festival, which McFarland organized with rap star Ja Rule, was advertised to feature bands including Blink-182 and the hip hop act Migos. It collapsed at the last minute, with people stuck on the island left to chronicle the lack of preparations and to find their own way home. He pleaded guilty to two counts of wire fraud, both of which carry a maximum 20 years in prison. Under a plea deal with the government, both sides agreed to non-binding guidelines that would yield a sentence of eight to 10 years and a fine of as much as $300,000 when he’s sentenced June 21. McFarland agreed to pay restitution. “McFarland promised a ‘life changing’ music festival but in actuality delivered a disaster,” then-acting U.S. Attorney Joon Kim said in a statement at the time of McFarland’s arrest. McFarland is free on bail, living with his parents in New Jersey. He was released on $300,000 bail July 1 after spending a night in custody, forced to leave behind a $21,750-a-month Manhattan penthouse and $110,000 Maserati.